This workshop caters for the needs of those for whom training in the workplace is a large part of their job, or is their full job function within a structured training and assessment system. These people would generally be working with nationally endorsed Training Packages and would hold considerable responsibility for training and development of personnel within the vocational education and training (VET) system. This course forms part of the Cert IV in Training and Assessment. Those wishing to participate in this course should first complete TSA’s TAE Literacy Skills Check. For further information about this, please contact a TSA Training Advisor. These units contribute to the TAE40116 Certificate IV in Training and Assessment. Source a nationally endorsed unit of competency for which they could design a training program and bring a copy of the unit to the course. 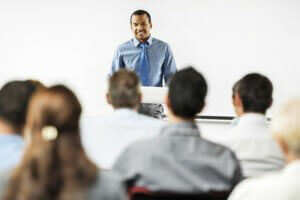 Give thought to a topic for a 30 minute training session that they will be required to deliver to a group of other participants on the final day of the course. Participants should also make arrangements to ensure the necessary resources are available to deliver their session to approximately 7 people. Those who have not attended Training Services Australia’s Introduction to VET course should complete the module on ‘Introduction to Training packages‘ before attending this course. To complete the assessment for this course, you will need to have access to a group of at least 8 people to whom you can deliver 3 training sessions (each at least 40 minutes duration). You will also need access to equipment to video your training delivery (a smartphone may be used) and a USB memory stick to submit your training video to TSA.